Then…then…then….nothing happens! I can’t believe it. The machine has eaten my money! I dash over to the ticket booth that actually has a human in there. ‘You’re ticket machine is not working!’ I say as I hand over my Myki card and another $20. ‘That machine has got nothing to do with me,’ says the stern-faced blue-uniformed station master, and then credits my card with the thing that has nothing to do with him. I take the card and get on the train but in my imagination keep going, inventing conversations with ticket inspectors demanding to see my card. ‘No, no. You can’t have that,’ I say. But then it’s time to get off at Flinders and with everyone else I trudge up the escalators, marching to the same beat of resignation, as we ping our cards through the ticket scanners. Recently, I had the good fortune of having a bit of chat for my RMIT podcast, ‘A Bit of Chat’ with the creators of the Australian web series, Bruce – Warwick Holt, Mat Blackwell and Tony Rogers. It was a wonderful opportunity to talk with such great comic minds and they gave a real insight into the challenges (and joy) of trying to tell Australian stories in an increasingly US-dominated market. Set in 1788, Bruce is a comedy web series about Bruce Williamson, a hapless young man who deliberately becomes a convict so that he can follow his lady love, Daisy, to the new penal colony in Australia. Alas, she has fallen for a soldier and thus Bruce if forced to share a small tent with Garry, an incompetent hangman; and Mick, an erudite serial killer. Avoiding the avenging codes of chivalry from enraged British soldiers, Bruce also tries to get along with the original inhabitants who want nothing to do with him nor any of his kind. It’s a wry and dark look at our humble beginnings while engendering Australian sense of humour. Ten years in the making and made on a minuscule budget (yet looks impressively big budget), the series has been shown on youtube only and has already had a huge following. Here, I speak with Warwick Holt. Warwick is one of Australia’s top comedy writers. As head writer on The Project, Warwick is not only the Winner of 5 AWGIE Awards, he also has a Masters degree in Applied Maths. He has written for Good News Week, The Glass House, The Great Comedy Debate, Good News World, The Sideshow, The Ministry of Truth as well as a documentary, The Phandom Menace. These are just some of the many projects that Warwick is involved in. 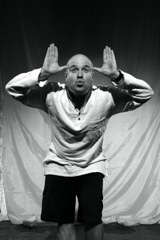 Next up, is the multi-award winning writer, Mat Blackwell, has been writing stories since he was a wee boy. It wasn’t until he met Warwick Holt that he got drawn into the television world, writing for The Glasshouse, Good News Week, Sideshow, Wednesday Night Fever, to name but a few. Co-writing with Warwick on Bruce, Mat has also written a speculative novel, ‘Beef”, a love story roasting in the future of a vat meat world. Lastly, Tony Rogers. The acclaimed director, apart from directing many award-winning television commercials, has had a very successful run of comedies such as How to Speak Australians, Rats and Casts, Fourth of July (Won’t Last), FUNT and of course, Wilfred, which has gone on to be made as an HBO version starring Elijah Wood. Thanks again to Warwick, Mat and Tony for their generous time. The minimalist set favoured our performer’s animated impersonations, allowing McGilton to show off his dynamism in the form of fast-paced characterisations. It’s possible that anyone with particularly tender sensibilities may be offended by renditions of enthusiastic monkeys or human gastroenteritis, but McGilton is just telling it as it is. This is an exciting and captivating journey to engage in and lives up to its promise to take you into a world of searing heat, overwhelming dust, sore butts, sacred cows and sweaty balls. A vivid hour to tantalise wannabe travellers. And so begins Russell’s chaotic adventure as he attempts to cycle from Bombay to Beijing in the quest of writing his travel opus. Tickets are already selling fast for the Adelaide Fringe! For Melbourne Festival, click on the image below to take you to the booking page. 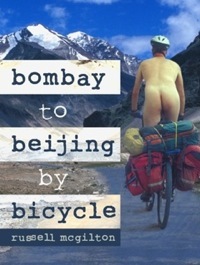 The latest revised version of Bombay to Beijing by Bicycle is available at Momentum Books. Bonuses include over forty photographs of the trip, maps and script of the award winning one man show (see Bombay to Beijing by Bicycle). My second point, is that Bane has this rich plummy, Richard Burton voice but so shrouded with mumbles he sounds like he’s wearing Kenny from South Park’s anorak. You can’t understand a word. Not only is his voice incomprehensible, it’s not geographically correct. You see, Bane grew up in a prison at the bottom of a pit. When Bruce Wayne ascends from the same pit we see that it’s just outside the blue city of Jodhpur, India. Somehow, I just don’t think Gotham would buckle. Yelled at, sworn at, thumped at and chased by religious zealots. Santa goes toe to toe with Melbourne’s general public on the trams. ‘Do you get paid to act like an idiot?’ a middle-aged woman asked me while I re-adjusted the faux paunch in my Santa suit. She thumped me with her hand bag then jumped off at the next tram stop. While my last remark may have been duly met I did come to the conclusion that some of the general public had the manners befitting a horde of Orks at a Hobbit tea party. While most of these incidents were like water off a nun’s back, there was one thing that had me ready to Rudolph someone’s nose – asking for chocolate. Despite making it clear to everyone that the chocolate in my Santa Sack was for children only (though I admit I readily helped myself to them), this did not dissuade adults. Some were positively rabid. Maybe I should’ve relented but it was much more satisfying seeing a fully grown adult screaming for a Freddo Frog in forty degree heat. I moved away from her to the end of the tram and plied my Christmas charms on a five year old boy and presented him with a chocolate the Kentucky woman had screamed for. To my surprise, his father snatched it out of my hands. ‘NO! NOOOOOOOO!’ he barked, his eyes wild. ‘We’re Jewish!’. Apparently, I was supposed to know. But no nothing prepared me for what I was about to experience on my last day: What does Santa do when he gets motion sickness? There I was during a verse of ‘Tis the season to be jolly’ when I felt the sudden urge to purge. I ran to the back of the tram, barking like a seal to the driver’s compartment (it was an old W class tram), children and parents grabbing at me while I tried not to ho-ho-ho into their laps. Unfortunately, the kids had followed me and their faces were nowpressed up against the partition window. Thus I found myself with the vexing question of how I was going to hurl? Would I simply rip the beard aside and break the magic for the kids or stay in character and let the muck pump and strain through it? But before I knew it I was retching into the chocolate esky bag, beard above the top lip and doubled over. I could hear the cries of children ‘What’s wrong with Santa? What’s wrong with Santa?’ then suddenly fade as horrified parents yanked them away from ‘that thing at the back of the tram’. I held one polite frozen moment then broke rank to the nearest bin, flipped up the beard and at last gave it a good ol’ ho-ho-hoooooooooo! I realised then, that yes, yes at last, the inevitable had happened: I was sick of being Santa.